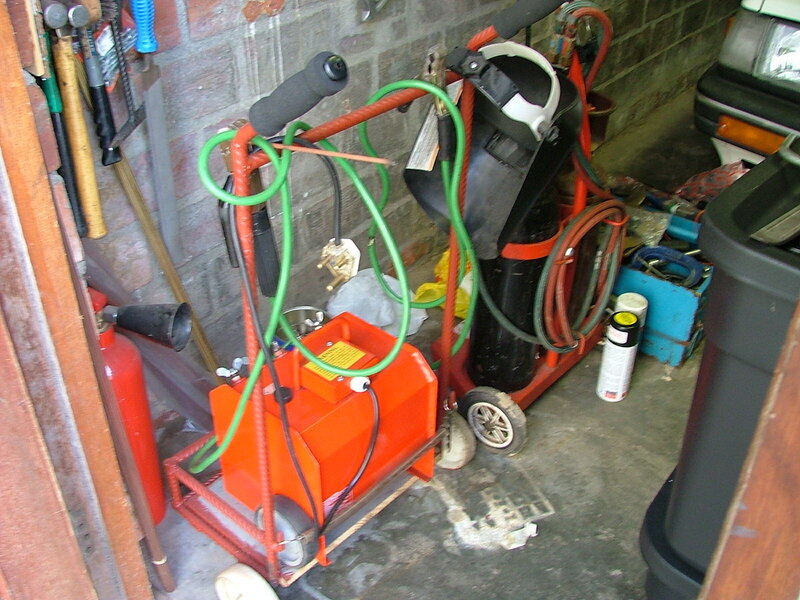 This pic shows my PortaPak oxyacetylene set and an Afrox Transarc 140 Amp oil cooled arc welder. 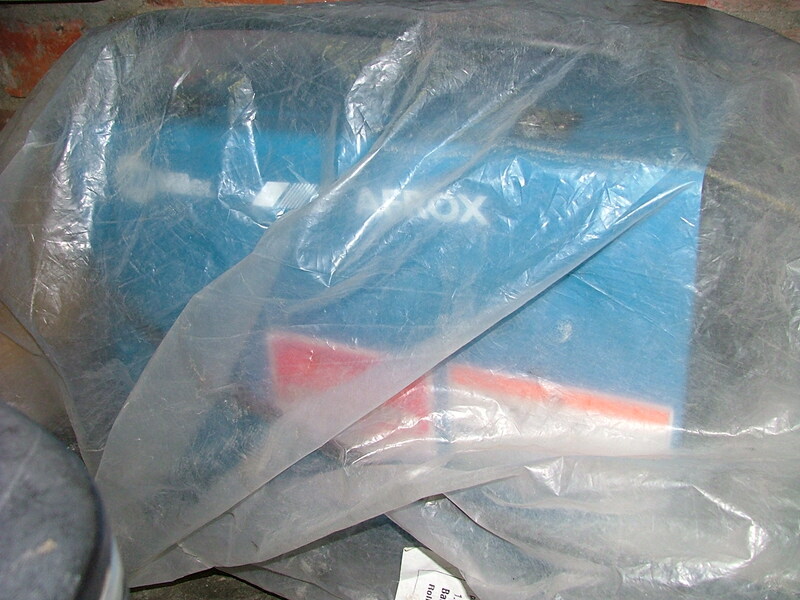 It all started in April 2003 when I bought the oxy set for a song. My 1st welding with the oxy was on sheet metal. Unfortunately I exhibited too much enthusiasm so the end result looked a bit like wrinkled paper – Mr. Distortion had a field day. I did some other dangerous things too like cutting a geyser cylinder in half while my 5 months old son was sitting wide eyed in his pram about 10 metres away, before coming to my senses. The arc welder was next and it really tested my endurance. It has a 25 Amp breaker requirement but stupid me ran it off a 20 Amp breaker. The breaker kept on tripping so I was contiously walking up and down to reset the breaker rather than welding. However I made do – my skilled improved eventually so that 9 times out 10 I could hold a bead without any problems. 3.15 mm rods however were the end of me as they immediately stuck to the workpiece as soon as I got an arc started. I eventually upgraded the breaker to 30 Amp and al my worries were over. After setting a pile of wood on fire while arc welding, I realised that safety should be my first concern. That's when I got gloves, fire extinguishers, overalls, safety boots, face masks, etc. The MIG welder was next; My car was leaking like a sieve when it rained and I decided that by doing the repair job myself I could rather spend the money I would have paid a panel shop, on a MIG welder. It proved to be both a wise and a stupid decision. Wise because no panelshop would have done the job as meticulously as I am and stupid because I've been busy for the past 4 months cutting out rusted sections, doing prep work, welding , etc. It's a real battle getting consumables for this welder as it only takes a maximum of 10 Kg spools and a wire thickness of 0.8 mm. Up to this day I have'nt been able to source a stainless spool so at times I believe that buying this machine was probably one of the biggest mistakes I made. I also have'nt welded anything greater than 0.8 mm with the machine but it really shines on thin sheet metal. MIG is not a bad process altho I view the machines a bit cumbersome to operate and a bit misleading (a good weld will look good and a bad weld can also look good). Most of the skill lies in setting the machine correctly, but once you get going it is very easy and fast. 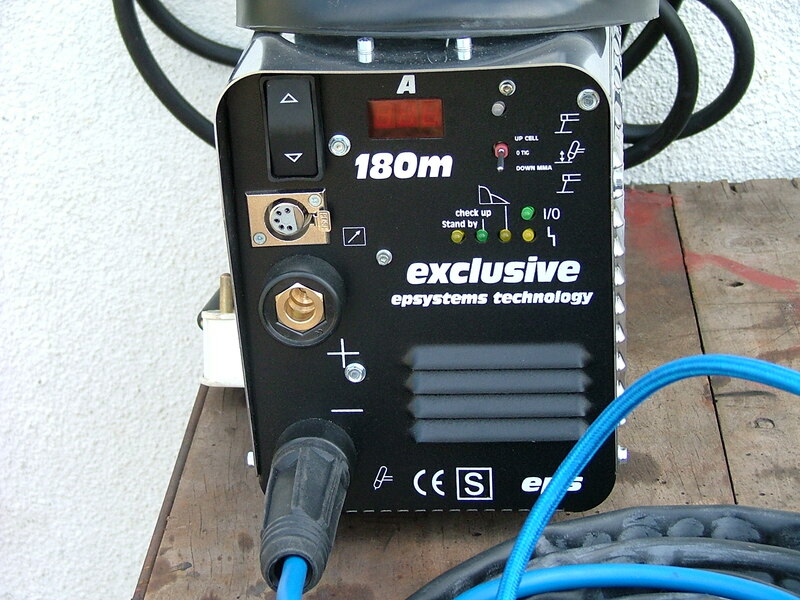 The inverter I bought from my wife's company who decided to import welding machines from Italy for their industrial clients. One of the directors heard about my difficulties regarding consumables with the MIG and offered me the inverter at cost – what a stroke of luck. I really was not interested in TIG welding but knew that I could not pass up an oppurtunity like that. I was a bit worried about support and quality because at that stage mine was the second order they placed for such a machine. However it seems that I made a wise choice because apparently it is selling like hot cakes now here in SA and is mostly used for TIG welding by their customers. What is really nice about the machine is that it's duty cycle is 100% at 180 Amps so no need to let it cool off + it has got a remote as well which I've put on order. I have'nt done any TIG with the machine yet– did a little bit of stick just to test it, but hopefully will get up to scratch within the next 2 months before starting to build my chassis. 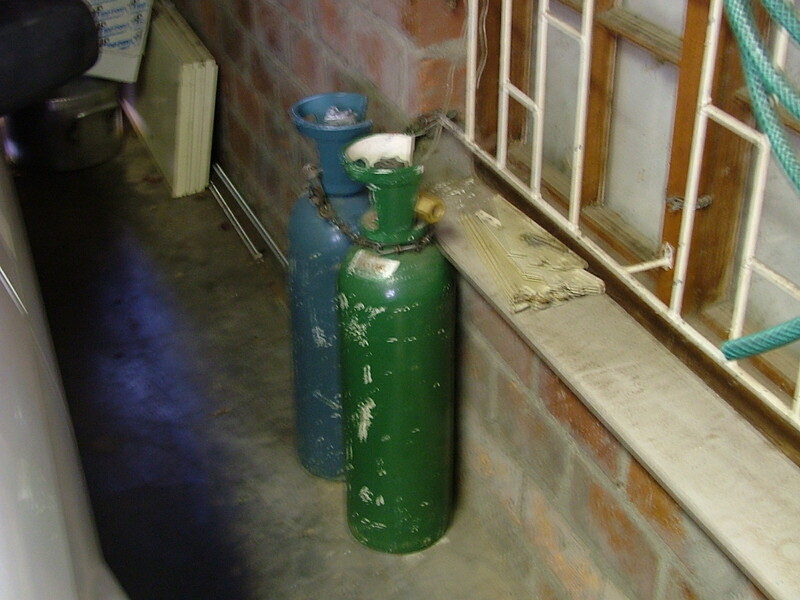 Here is my CO2 and Argon. If you look carefully you'll see that the seal on the Argon has'nt been broken yet – got it last Friday and been too busy welding in new sections on the car with the MIG (yawwn). You can also see how small my garage is – no real space for a nice workshop. The small bottles is really not financially feasible; but due to lack of space that is what I must use for the time being. 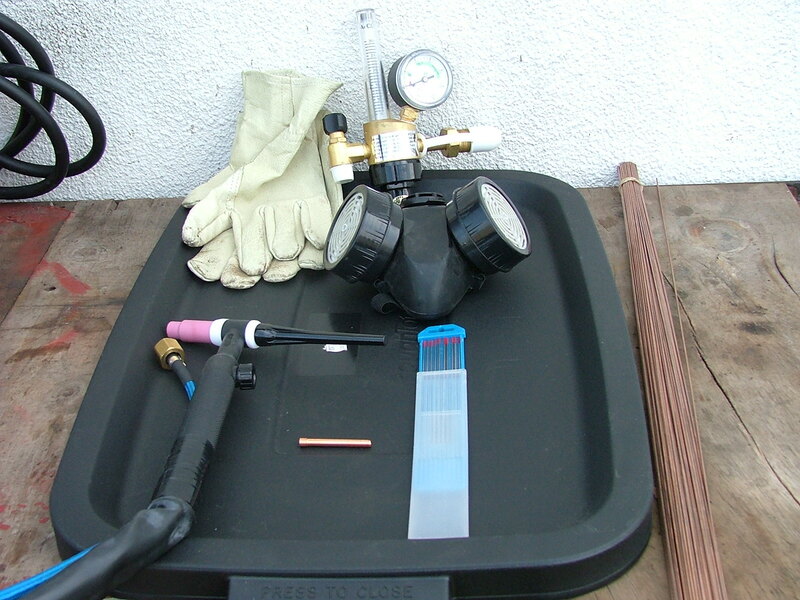 Here is the rest of my TIG setup: the torch, the collet, tungsten tips, mild steel filler rod, air flow meter, pig skin gloves and a respirator. a. Weldors are probably the friendliest bunch of people on earth. Do'nt be afraid to ask and no question is stupid. BUT always assess the advice given. b. Be comfortable and take your time. c. Do not be scared in trying new rod angles, etc. d. Always assess your work realistically and try to work out where you made mistakes and how you can improve. e. Welding is simple physics. The weld pool is fluid so think about how the pool will react. f. Safety first. Try to get a good auto darkening helmet. Always wear gloves and a respirator – otherwise try not to inhale any of the fumes. g. Try to get a view of the weld pool; ignore the arc. If you cannot see the pool use your ears – listen; you can hear when a weld is good or bad. h. If you are reading this; there are lots of info and resources on the NET – research, research and research. i. Never give up!! Never let any criticism get you down! I'm still learning – 50% of the time I make a beautiful weld, the other times I grind the weld down and start all over.